Our sculpture of an angel descending from the heavens and holding out flowers, adds an inspiring memorial addition for a loved one. The angel sculpture is created from heavy duty granite and comes beautifully crafted with immaculate details on the wings and tresses of the angel's gown. 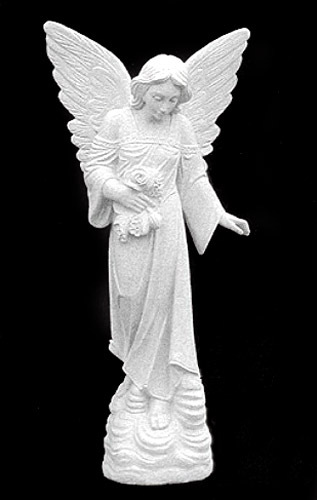 Hand finished by sculptor and suitable for use in the cemetery or as a grave marker. (Also available: 36"H, 48", 60"H. Please inquire at csr@kaccents.com). Normally ships in 4-6 weeks. Made in Italy.